The storage of hydrogen and the development of fuel cells are one of the main issues for the development of renewable energies in the next few years. 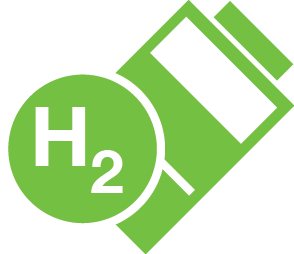 Metal hydrides specifically are receiving much attention as a storage media for hydrogen. In the development and characterization of metal hydrides for hydrogen absorption, the thermal conductivity of the material is a crucial material performance property. The thermal conductivity of the solid material is important to know how long it will take to get the pellets to an equilibrium temperature where they will begin releasing hydrogen. Furthermore, it is important to know the thermal conductivity of these pressed powders while engineering a storage device to use the powders commercially. The thermal conductivity of the material changes substantially from a powder to a compressed solid, necessitating the direct measurement of both material formats. The C-Therm TCi Thermal Conductivity Analyzer offers the flexibility to test both powder and pellet formats within a glove box environment. 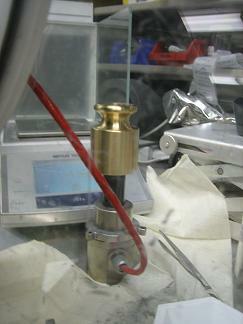 Use of a glovebox is required in testing the materials due to the highly reactive state of the metal hydrides. 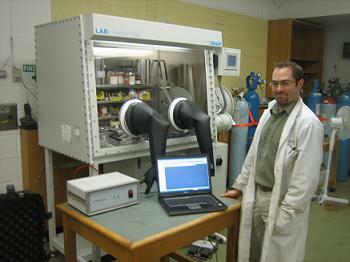 The glovebox is purged with argon or nitrogen gas. The test results are to be presented at the International Thermal Conductivity Conference (2009) to be held this year in Pittsburgh, PA. Results will be discussed in relation to other performance data on the materials. The hydrogen absorption of the material was also measured with the Setaram / HyEnergy's PCTPro-200 at the University of New Brunswick and the heat capacity of the material was measured with the Setaram Micro DSC at the Setaram facility in Newark, CA. Managing Director of C-Therm Technologies Ltd.
C-Therm wishes to recognize the contributions of Dr. Shane Beattie of the University of New Brunswick , and Dr. Ivan Levchenko of Setaram Inc. in this initiative. Additionally, C-Therm appreciates the efforts of Christopher Wilson of HSM Systems in providing valuable input throughout the process.